As of Sep 27th 2018, DPF700 Rate Meter models will be discontinued. As a possible replacement, please check out DPF20 or consult our sales for UL certified replacement for details. 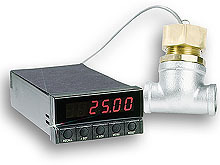 The DPF701 Series ratemeter/ totalizer offers user programming via the 5 front-panel keys. Scale factor may be programmed from -99,999 to 999,999 (any decimal point, multiply or divide), while offset may be programmed from -99,999 to 999,999 (any decimal point). Programs are stored in non-volatile memory, with three levels of program lockout for security. Optional features include Hi or Lo setpoints for control or alarm, plus RS232 communication. Fixed decimal point or autoranging is standard. Type: single input. TTL, CMOS, NPN open collector, contact closure and magnetic pickup compatible; selected by dip switch. Non-isolated. Note: Comes with complete operator’s manual.